What Are the Benefits of Barley Grass Juice? What Are the Benefits of Barley Grass? Oat straw sounds like a product farmers might feed to livestock, but it’s actually part of the same plant from which oatmeal comes and has been used in folk medicine as well as for food. 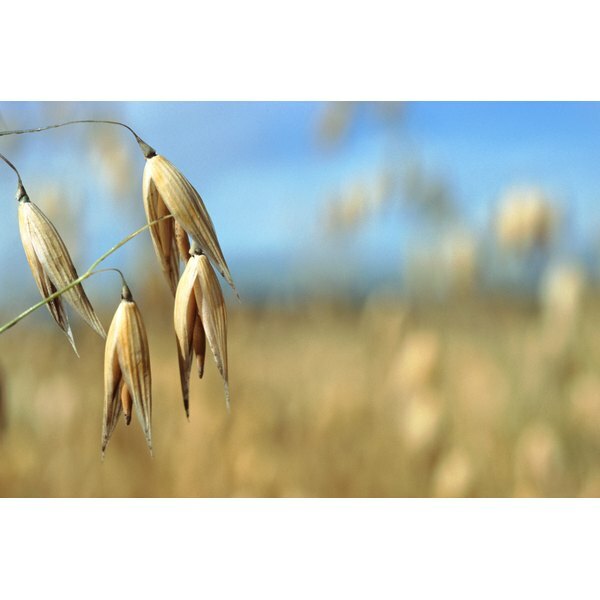 In the Middle Ages, oat straw was touted as a brain booster, and more recently oat straw extract has been marketed as a sexual enhancement supplement. Since very few studies have investigated oat straw for these and other claims, use caution before adding oat straw extracts to your diet. The mature oat plant produces the grain you know as oats, often promoted as a food that can lower cholesterol. Oat straw, however, is the green, unripe part of the plant, both leaves and stems, and is sold as Avena sativa, green oats or wild oat extract. You can find it in some health food stores and on the Internet as a powder, juice, tincture or as a tea. Oat straw’s use as a behavioral agent dates back to at least the Middle Ages. Wild oat extract has the ability to reduce the effects of two enzymes tied to depression the same way some prescription medications do. Researchers in Switzerland published study results in “Phytotherapy Research” in October 2009 showing that a wild green oat extract reduced stress and improved socialization behavior in rats. One of the only other studies to investigate oat straw's effects on mood was sponsored by a company that manufactures a commercial oat straw product. The double-blind study, published in the “Journal of Alternative and Complementary Medicine” in May 2011, showed some improvements in cognitive performance in healthy subjects as measured by quantitative brain mapping technology. In the 19th century, the German Pharmacopoeia listed Avena sativa as an aphrodisiac. Most of the commercial products on the market today use oat straw alone or in combination with other herbs like saw palmetto for sexual performance, claiming oat straw works by increasing the amount of testosterone in the blood. Much of the contemporary research for such claims has been conducted by the nonaccredited Institute for Advanced Study of Human Sexuality in San Francisco. One of the Institute’s double-blind, placebo-controlled trials of 75 men and women purportedly found oat straw enhanced sexual experience for men but not for women. A separate Institute study testing their oat straw product on impotent men found a partial response to treatment. Some evidence in the 1970s indicated that oat straw might be beneficial in helping smokers to quit, including one report, published in the journal “Nature,” of an Ayurvedic medical practitioner in India who had successfully treated both opium and cigarette addiction with oat straw. However, other studies since have showed negative or mixed results, such as a double-blind study published in the “International Journal of Clinical Pharmacology and Biophamacy” in October 1976, demonstrating Avena sativa had no effect on heavy smokers but moderate effects on helping light smokers break the habit.